This might be my most anticipated Friday in a really long time. This past week I subbed for a teacher until today, which was great because it was four days of work. However, it just happened to be state testing week, which means it was completely crazy and unpredictable. I loved nearly ever minute of it, because the days went really fast and it was great experience for me. Anyway, on to blog stuff. I am really close to posting up a new poll, I really think this one could get interesting but we'll have to see. Also some of you have found blog on Twitter, but for those you that haven't here is the link @TheConverseBlog. 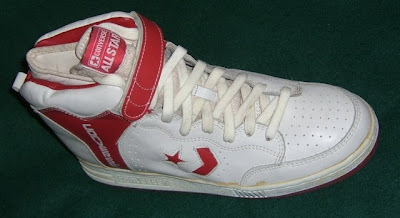 Now onto today's post, the Converse Maverick. 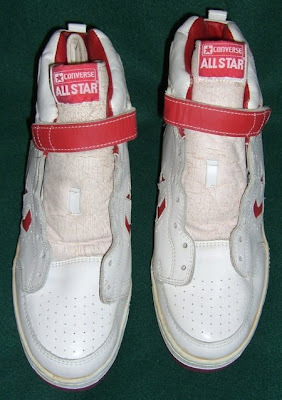 This basketball shoe from the 80's is jam packed with all kinds of goodies, ankle strap, double ankle padding, inner mid-foot strap, and even a Y-bar. 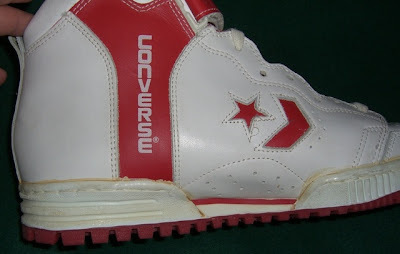 Also you've got vertical branding with Converse written down the side of the shoe on the Y-bar. 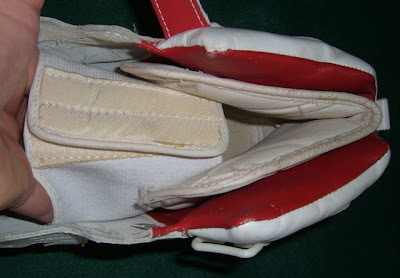 A few years ago they re-issued the Maverick, but without the inner booty strap. Oh well, I am comtimplating a post for tomorrow, but I am not sure yet...so check back and vote in new poll when it goes up. Enjoy the NBA playoffs tonight, I an so excited that I finally get to stay up and watch a Lakers/Rockets game! This was a GREAT shoe. 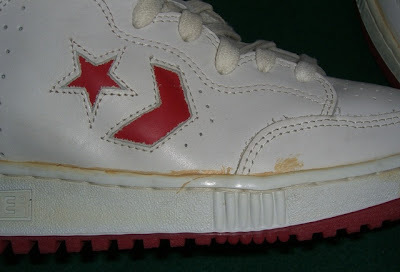 I was selling for Converse at the time that this shoe came out in the early 80's. 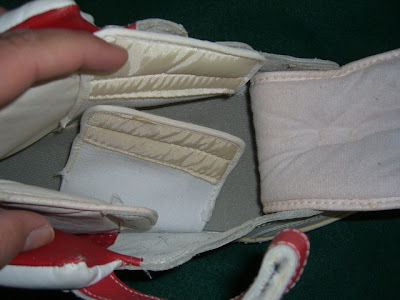 It was FAR ahead of it's time in terms of technology in a basketball shoe, and if you take a look at most youth, high school and college players today you will see similar ankle support bands and wraps being worn in addition to sub-par technological shoes . . . when we sold this shoe to sporting goods dealers we used the phrase "This is the first time ever that Running shoe technology has been put to full use in a Basketball shoe". Which was much easier to say than to get the sporting goods team dealer or floor sales person to understand and get kids, parents, coaches to buy when you were talking about a $95ish retail shoe . . . in a time when most basketball shoes were in the $35-$55 range. 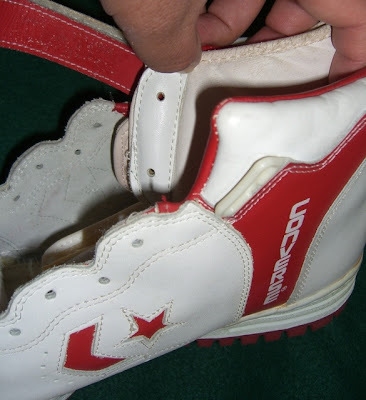 It was truly a groundbreaking shoe and initially held a very small share of dealer's inventory or shelf space but it certainly helped to re-establish CONVERSE as the leader in Basketball shoe innovation and committment to the sport and the basketball athlete in a time when they were taking all kinds of shots from all sides by the likes of Nike, Adidas, Reebok, and even many of the smaller running shoe/fitness shoe/fashion manufacturers like New Balance, Avia, Kaepa, Puma, LA Gear and a few others that thought Converse was easy to pick on because they may have lost their edge. Fred that was awesome I wish we could get more people from Converse to come and talk about the good old days. 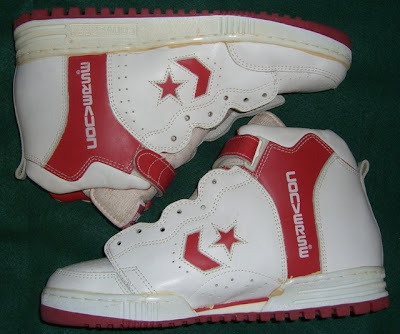 As Converse goes I was a relative short-timer back then when I worked for the company for 5 1/2 yrs. as the Westwood Retail Store Manager and later at the Manufacturer's Rep in Central CA and the Las Vegas area. Back then there were several guys that I worked with that had been with the company for 10,15,20 and even 30+ years at time. 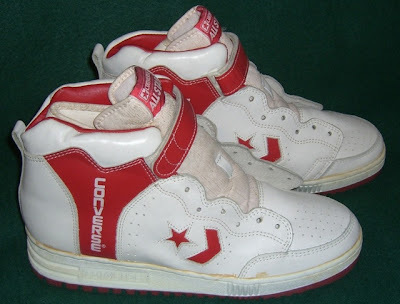 When I was with Converse there were even 3 US factories still in service pumping out Chuck Taylors, Dr. J's, the old Tennis line like Jack Purcel's and Skidgrips, and some of the high end custom makes for the athletes. They were in Lumberton, NC; Presque Isle, ME and Malden, MA. A lot of very, very proud Converse workers that were incredibly dedicated to their jobs and the company back then. Wow, this brings back good memories. 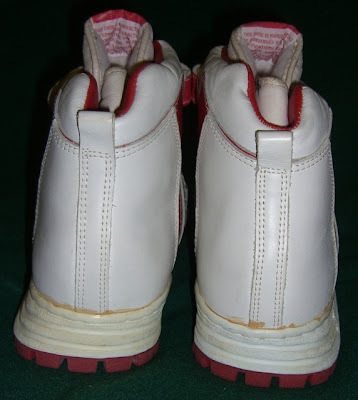 I was twelve or thirteen when this shoe came out and I thought the price back then was outrageous. 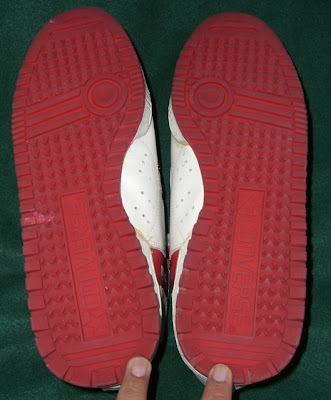 This was THE most expensive shoe back then.Up to that point the original Nike Air Force One was the most expensive but then Converse introduced the Maverick and the Weapon. 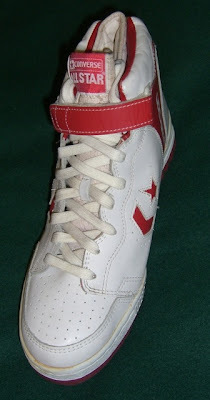 My basketball team was sponsored by Converse, and they made the BEST basketball shoes back in those days. 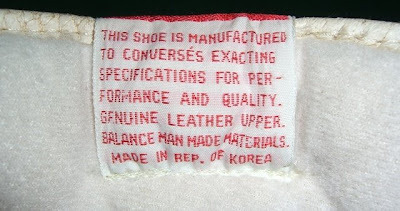 It was interesting to see the quality and material differences depending on where a shoe was made, i.e. Yugoslavia, USA, Korea or whatever. 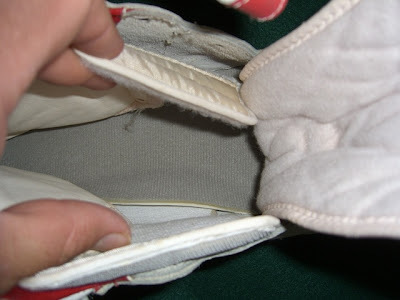 Sometimes, the same shoe would look slightly different due to different leather.